Who needs guns and missiles? Lasers are the future of warfare. Earlier this year, two laser weapon systems developed by Boeing successfully demonstrated the ability to fry unmanned aerial vehicles (UAVs). 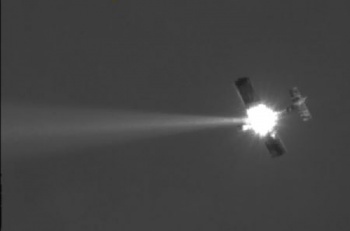 The first, dubbed the Mobile Active Targeting Resource for Integrated eXperiments (MATRIX), was able to destroy five UAVs from various ranges using solely a single high-brightness laser beam. The second, called Laser Defender, also killed a UAV but uses a combination of laser and kinetic energy weaponry (i.e. bullets). MATRIX was developed under contract by the Air Force Research Laboratory, while Laser Defender is a Boeing-funded creation. Bill Baker, chief scientist of the Air Force Research Laboratory's Directed Energy Directorate, believes these tests "validate the use of directed energy to negate potential hostile threats against the homeland." MATRIX's performance was particularly impressive, due to its "unprecedented, ultra-precise and lethal acquisition, pointing and tracking at long ranges using relatively low laser power." Boeing realizes that shooting lasers at ground vehicles from the air is just as important as shooting at air vehilcles from the ground. The company is apparently the leader in laser weapon systems, also developing the Airborne Laser (i.e. truck killer), Advanced Tactical Laser, Free Electron Laser, High Energy Laser Technology Demonstrator and Tactical Relay Mirror System, which all sound like they'd really leave a nasty burn on your forearm. There is something much less visceral about a laser as opposed to a thundering gatling gun, though the laser seems like it has its advantages. So, when do phasers get here?